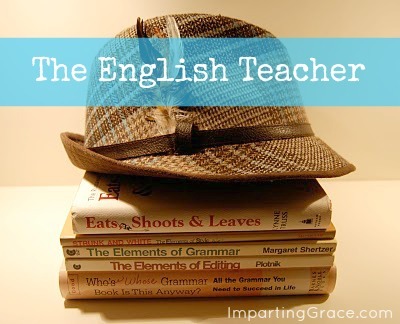 Back for a third installment in my series of posts about English grammar! I hope y'all are enjoying these posts and finding them helpful. I should explain that I am not a typical English teacher. These days, most English teachers are primarily responsible for teaching literature and writing. My training specifically prepared me for teaching English grammar, which is what I love to teach, and most of my classroom experience is in teaching grammar. My degree is in secondary education in English. I've been certified to teach in two states (Tennessee and Michigan). So I'm a bona fide English teacher, but I'm a little weird. Our first two lessons were about words that often give writers trouble: its and it's and your and you're. You can click here for the its/it's lesson and here for the your/you're lesson if you'd like to review. Today, and from now on, I'll respond to questions posed by readers. 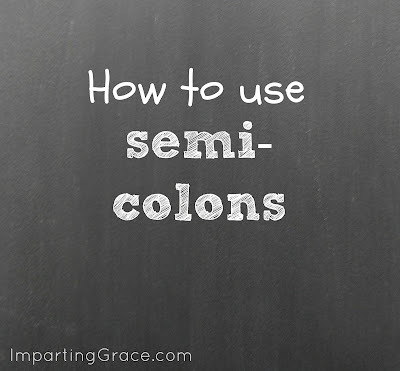 Last week a few readers asked about the use of semi-colons. 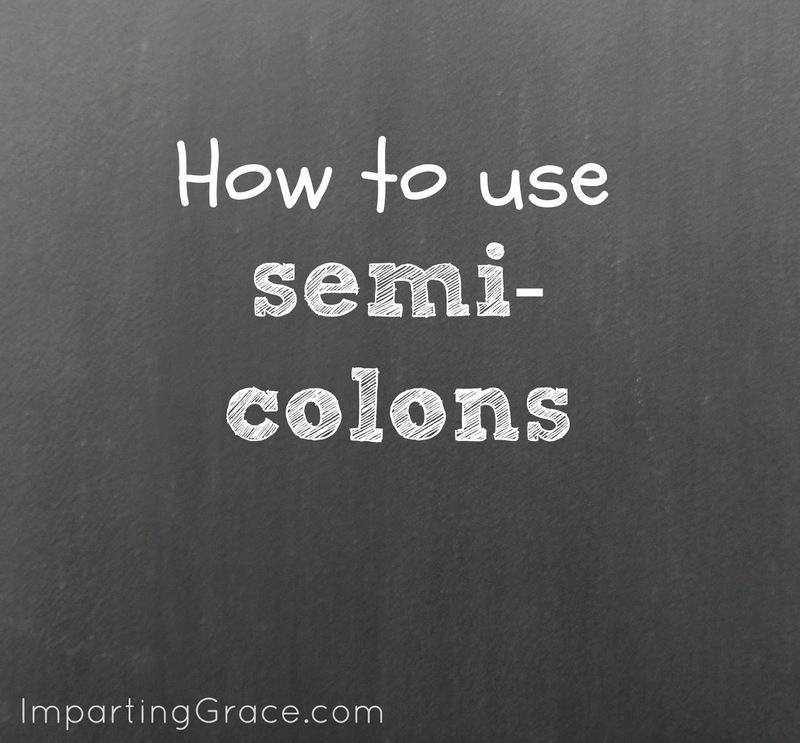 The semi-colon is a useful bit of punctuation, so here's what you need to know about it. 1. Semi-colons are used in the formation of compound or complex sentences. If you don't want to use them, you can avoid them by keeping your sentences simple. But they're a handy tool if you want to combine two independent clauses (that is, two clauses that could actually stand on their own to be complete sentences) into one sentence. You can either use a comma and a conjunction (such as and or but) between the two independent clauses, or you can use a semi-colon. The state requires nurses to be licensed; in doing so, it ensures a basic level of competence. "The state requires nurses to be licensed" could be a sentence all on its own. "In doing so, it ensures a basic level of competence" could be a sentence all on its own. Each of those clauses has a subject and verb. So you can't just string them together unless you have a proper way to connect them. The semi-colon provides one proper way to connect them. 2. You often see two independent clauses put together into one sentence by the use of a conjunctive adverb such as however, nevertheless, therefore, or furthermore. (Nobody really cares that these words are called conjunctive adverbs, but that's their official name.) The correct way to punctuate a sentence like this is to place a semi-colon before the conjunctive adverb and a comma after it. The consultant depended on the information provided by the research assistant; however, the assistant's research was flawed. Students must complete several pre-requisite courses before they may declare the music performance major; furthermore, they must audition and be accepted into the department of music. 3. You already know that you should separate items in a series by a comma. For instance, if you're naming children to be invited to a party, you might say, "Emily wants to invite Ashley, Marianne, Sarah, Lauren, and Susie to her party." But if you're writing a series of items and those items themselves include commas, you should separate the items with semi-colons. They need to choose a date for their wedding. They're considering December 18, 2010; January 8, 2011; and January 15, 2011. The conference attendees were from Durham, North Carolina; Charlotte, North Carolina; Charleston, South Carolina; and Richmond, Virginia. The principal considered complaints from the teachers, who first reported the incident; the students, who believed they had done nothing wrong; and parents, who wanted what was best for the students. That pretty much sums up the use of semi-colons. As you can see, they're quite useful in making sentences logical and orderly. Sentences using a semi-colon can be pretty long and a bit complicated, but the use of the semi-colon keeps them from being confusing. And that's really the point of using punctuation--to make the written word understandable. When we speak, we can use tone of voice, inflection, and pauses to make things clear. Those tools aren't available to us when we write, so we depend on word choice and punctuation for clarity. Please let me know what questions of grammar you'd like for me to address in these posts! I want to make this feature useful to you, so I'd love to know what you want me teach. 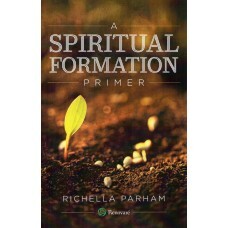 And if you have a specific question about grammar, feel free to email me [richellap (at) gmail (dot) com]. I'll be happy to help if I can! Wow. I have always done ",however," I'm so glad you posted this! :) These are so helpful!!! Have a great day. Semi-colons have always stumped me. I never knew that rule about using them in a list of items that include commas. I know I always use the dash inappropriately, as well. Unfortunate, since my writing tends to be sprinkled liberally with the things! Thank you! This was such a helpful lesson. I should print these out and make my own grammar book. It's funny how that little tiny mark (;) scares me to death. Correct grammar is important to me and I tend to notice grammar mistakes; therefore I often avoid the semicolon for fear that I will use it incorrectly. Poor use of words annoys me more than punctuation. Love this post! Thank you so much! I understand completely. You are a very good teacher. I think a tab on your blog for grammar lessons would be very useful. I'm not even sure when the ... is appropriate, but I love to use it. This was great about the ;! I'll have to check my posts now! Thanks! See lots of ! I need to save this one. :) I think I may actually understand semi-colons now. Thank you!!! That was so helpful! I just hope I can remember it:) I love the help so keep them coming. This is very interesting, but I couldn't help noticing in number three '...You already know that you should separate items in a series by a comma. For instance, if you're naming children to be invited to a party, you might say, "Emily wants to invite Ashley, Marianne, Sarah, Lauren, and Susie to her party." ... there is no need for a comma after the last item mentioned before the 'and' ie after 'Lauren' there shouldn't be a comma. But you knew that, right? In reply to Autumn Mist, I have to say that no, that's not the rule. When listing items in a series, you should include a comma after every item in the series, including the item before the comma. Not including that comma is a frequent mistake. Autumn Mist, I wonder if perhaps the rule here is different in the U.S.? For the most part our grammar rules are the same, but this may be an exception. I am sooooo glad you are doing these posts!